Elgin, IL- While free bagged leaf collection began October 1, the City's on-street collection program will begin on Monday, October 29 in designated areas. Both leaf collection programs run through the last week of November. These programs help residents remove seasonal yard waste, as well as lessen the potential for flooding from excess leaves left in the street that can block storm sewer drains. Beginning October 1, Waste Management has not require stickers for yard waste bags. Bagged leaves are collected weekly on residents’ regular garbage pickup day. State law prohibits the disposal of leaves and other yard waste in landfills; therefore, these materials cannot be placed in plastic garbage bags or mixed with normal garbage. Please also be aware that leaf burning is prohibited in Elgin. Yard waste includes materials such as leaves, brush, branches, grass clippings, plants, weeds and other similar waste. Yard waste must be placed in biodegradable Kraft paper bags (maximum 33 gallons and 45 pounds) for collection. Yard waste placed in plastic bags will not be collected. Beginning Monday, October 29, weather permitting, the City of Elgin will collect leaves raked out into the street in designated areas. 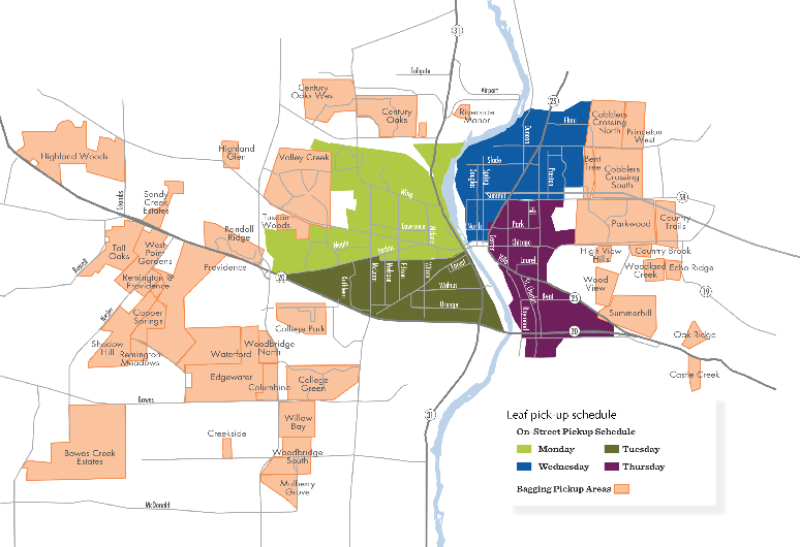 Leaves should be raked along the curb by 6:00 a.m. on the designated area's special collection day, shown on map below. Leaves placed in the street after the crews have passed will not be collected until the next scheduled date. Note: The on-street collection day may differ from bagged leaf collection day. Please do not mix trash, branches or other yard waste with leaf piles. Avoid parking on the street on scheduled leaf collection days; leaf piles blocked by cars will not be collected. Residents in the on-street collection areas may also place leaves in yard waste bags for free collection by Waste Management on regular garbage collection days. As part of Elgin’s sustainability efforts, residents are encouraged to compost leaves or mulch leaves into their lawn with a lawnmower. Mulching controls weeds, uses less fertilizer, enables better water infiltration, reduces thatch and improves soil quality. Please remember that weather and other delays may affect the published schedule. In the event of snow, all on-street leaf collection will cease as snow and ice control operations take priority. Therefore, residents are encouraged to bag leaves for weekly collection by Waste Management whenever inclement weather is forecast. For more information, visit the city's website or call Elgin 311. For updates throughout the leaf collection season, follow the city of Elgin on Facebook and Twitter or download the Elgin 311 mobile app, available in Google Play and the App Store. All yard waste bag pickups occur on residents' regular garbage collection day. See map for on-street leaf collections days based on designated area. Avoid parking on streets on scheduled leaf collection days.